Subarachnoid hemorrhage (Bleeding) refers to the presence of blood within the subarachnoid space, which is a space that lies between the brain and the arachnoid layer surrounding the brain. Direct, high-pressure bleeding from the artery leads to direct compression of the brain structures, and increased pressure within the brain, leading to neurological symptoms. Furthermore, the chemical substances in the blood may cause other arteries to constrict, and going into the spasm, reducing the blood flow to other areas of the brain, leading to stroke. Vasospasm1 is one of the most important determinants of outcome after a ruptured aneurysm is treated. Vessels of the brain are especially prone to vasospasm during the first 3 weeks after a subarachnoid bleeding. The spasm peaks at 2 weeks after a subarachnoid bleeding. Furthermore, the blood may disturb the usual uptake of cerebrospinal fluid, which is normally produced and taken up within the brain. This uptake disturbance by the blood may lead to fluid buildup within the brain, which is called hydrocephalus. Up to 30-50% of patients with subarachnoid hemorrhage die at the scene before reaching hospital. Of the remaining 50-70%, one third pass away during the first month, one third will be dependent during the rest of their life and only one third return to a normal independent life, making subarachnoid bleeding a seriously dangerous condition. Non-aneurysmal spontaneous subarachnoid hemorrhage secondary to a rupture of a small artery or vein usually has a typical pattern of the subarachnoid blood being in the perimesencephalic cistern. It is usually not associated with all the complications such as vasospasm and hydrocephalus2. As they arise from the blood vessels, aneurysms are better detected using angiography (images of the blood vessels), including computed tomography angiography (CTA, see figure), magnetic resonance angiography (MRA), or, most accurately, digital subtracted catheter angiography. Aneurysms can continue to grow due to continuous blood flow, leading to direct compression on the surrounding brain structures, leading to neurological symptoms. Moreover, due to thinning of the aneurysmal wall that worsens as the aneurysm continues to grow, there is an increased risk of rupture, leading to subarachnoid hemorrhage. Size3, location3, and form4,5 of an aneurysm are important determinants for risk of rupture. Although there has been extensive research showing that smaller aneurysms have small risk of annual bleeding, there are many small aneurysms that cause subarachnoid bleeding. Therefore, diagnosis of an unruptured aneurysm needs expert assessment for potential treatment. Risk of re-bleeding of a ruptured aneurysm during the first month after a subarachnoid bleeding is almost 50%. Therefore, a ruptured aneurysm needs to be treated. Irrespective of treating a ruptured aneurysm, the nature of subarachnoid bleeding exposes the patient for risk of Vasospasm and Hydrocephalus. Approximately one third of patients with subarachnoid bleeding develop Vasospasm during the first 3 weeks after the bleeding. Approximately one fourth of the patients with subarachnoid bleeding develop Hydrocephalus. Clipping: Aneurysms can be treated through opening the skull (craniotomy) and clipping the aneurysm (see figure 5 and video 1). Clipping of the aneurysm is a permanent treatment. Figure : Basilar tip aneurysm. See Video : Orbitozygomatic craniotomy for clipping of a Basilar tip aneurysm. 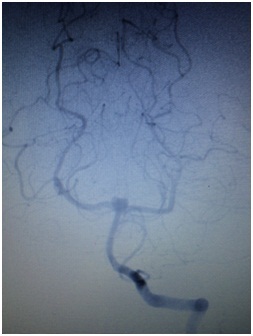 Endovascular coiling (embolization): Aneurysms can also be treated by the endovascular route. The aneurysm is reached by inserting a wire, usually through the groin and sometimes through the arm, that will be forwarded to the brain vessels, through which the aneurysm can be filled with coils that make the blood flow within the aneurysm to clot. Coiling of the aneurysm needs to be followed over years as the coils within the aneurysm, over time, get impacted and more coiling might be necessary (see figure). Figure : Pre-procedural and post-procedural images of coiling of an aneurysm. A and B: Pre embolization. C and D: Post embolization. By-pass: Certain large aneurysm cannot be treated by clipping or coiling. The flow by and through the aneurysm, makes it larger over time. Reversing the flow, will make the aneurysm disappear. Flow-reversal is provided either through an endovascularly placed pipeline, or by a classic by-pass procedure, through which, extra blood flow is provided to brain from one of the arteries of the neck so that the flow around the aneurysm changes and it will disappear. Clipping entails opening the skull, which takes a few hours, while coiling goes often through the groin and the procedure takes shorter time, so that in general, endovascular coiling has less immediate morbidity for patients. Over time, however, there are important benefits of clipping. The most important benefit is that once an aneurysm is clipped, then it is treated and risk of developing an aneurysm at the same location is gone, while with endovascular coiling, the treated aneurysm needs to be followed over the years so that the coil material will not be compressed by the blood flow and new aneurysm would develop at the same location. This means more angiograms, each with its own, even though small, risks. The location, size, form, neck-to-dome-ration of the aneurysm, patient’s neurological status, and age of the patients are important determinants of treatment. Each patient needs to have a tailored treatment strategy based on these parameters. There are many studies in the literature performed to answer what is the best treatment for ruptured and unruptured aneurysms. Generally, we recommend clipping of aneurysms in younger patients who have many years to live and coiling of the older patients. Certain aneurysms cannot be coiled irrespective of age and therefore they need to be clipped6. What happens after a subarachnoid bleeding caused by a ruptured aneurysm? The aneurysm needs to be treated as risk of re-bleeding is high. Many patients have concurrent hydrocephalus, which needs immediate treatment by inserting a tube so called ventriculostomy into the brain, releasing the pressure off the brain. Two main conditions can be associated with subarachnoid bleeding: Hydrocephalus and Vasospasm. Hydrocephalus: Some patients can over time be weaned off of ventriculostomy but those that will not, will need to convert the ventriculostomy to a permanent ventriculoperitoneal shunt7. Vasospasm: One third of patient with subarachnoid bleeding develop Vasospasms1. Patients are daily screened for vasospasm by Transcranial Doppler (TCD) measuring the speed of blood flow through the vessels. Vasospasms can be treated medically by raising the blood pressure in order to provide more blood flow to the brain, increasing the blood volume by giving patient more fluids and by increasing the blood’s rheological properties so that it flows better to the brain. Vasospasm that does not respond to medical treatment, can surgically be treated by undergoing a catheter angiogram while the interventionalist either injects medicines directly into the blood vessel that is in vasospasm, or dilates the spastic vessel by a balloon, the so called balloon angioplasty. Vasospasm is a feared natural complication of subarachnoid bleeding. Untreated, it leads to brain infarct (Stroke). Long-term outcome of treated ruptured aneurysm, is proportional to presence of secondary strokes caused by Vasospasms, making treatment of Vasospasm as one of the man priorities of subarachnoid-bleeding-treatment. Proust F, Hannequin D, Langlois O, Freger P, Creissard P. (1995). Causes of Morbidity and Mortality After Ruptured Aneurysm Surgery in a Series of 230 Patients. Stroke. 26: 1553-1557. Raya A, Zipfel GJ, Diringer MN, Dacey Jr. RG, Derdeyn CP, Rich KM, Chicoine MR, Dhar R. (2014). Pattern Not Volume of Bleeding Predicts Angiographic Vasospasm in Nonaneurysmal Subarachnoid Hemorrhage. Stroke. 45: 265-267. Wiebers DO, Whisnant JP, Huston J, 3rd, Meissner I, Brown RD, Jr., Piepgras DG, et al. (2003). Unruptured intracranial aneurysms: natural history, clinical outcome, and risks of surgical and endovascular treatment. Lancet. 362(9378): p. 103-10. Lindgren, A.E., et al. (2016). Irregular Shape of Intracranial Aneurysm Indicates Rupture Risk Irrespective of Size in a Population-Based Cohort. Stroke. 47(5): p. 1219-26.
de Rooij, N.K., et al. (2009). Configuration of the circle of Willis, direction of flow, and shape of the aneurysm as risk factors for rupture of intracranial aneurysms. J Neurol. 256(1): p. 45-50. Spetzler, R.F., et al. (2015). The Barrow Ruptured Aneurysm Trial: 6-year results. Journal of Neurosurgery. 123(3): p. 609-17.